I wandered across the sand at the Pembroke and L'Ancresse beaches, and then past another tower, Watchtower number 5, and then along the coast, around Fontenelle Bay and past abandoned greenhouses, overgrown and with smashed windows. I looked inside Fort Doyle, an early 19th century fort, and then onwards, around the coastline. I visited Le Déhus Dolmen, a prehistoric passage grave, that is atmospherically lit and large enough to walk inside. There's even a little wooden door that you open to go into the tomb. The next bay after that was Bordeaux harbour, where I stopped briefly before getting the bus to St Peter Port. I took photos of the yellow phone boxes, as excited as a tourist in London taking photos of the red phone boxes. Also: blue postboxes. On June 2nd, I visited the Little Chapel, a small church covered in shells and fragments of colourful china. I caught a bus to Vazon Bay and followed the coast around, walking past Fort Hommet, and then to Cobo Bay, where I paddled in the sea. 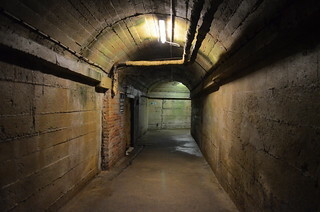 On June 3rd, I visited the German Military Underground Hospital, and wandered through the dark and damp tunnels there. I caught a ferry back to England that evening, to Poole, where I stayed a night at the Royal National Lifeboat Institute College, in a room looking over the harbour. I returned to London on June 4th and went to a pub in Peckham, which oddly had doors to Narnia and Middle Earth. I went to the London Hackspace with deathboy a few times to plan the musical ball pit and we made excellent progress. I am very excited about the musical ball pit! I took a trip to Brighton and went on a tour of the sewers, and then walked on the beach and played DDR on the pier, and then did a turn left, then right walk for the Flaneurs June Challenges and saw some good street art. I visited St Albans and walked around with some Ingress players, doing missions to get a banner, and I also saw the Roman mosaic, and my brother and sister-in-law. I had dinner with doseybat and pplfichi at Joy King Lau, and then saw When Marnie was there at the cinema, which was an excellent film. I visited Millennium Mills one evening, which was amazing to look around, and I bumped into blue_mai there. I went to blue_mai's party one Sunday. I went on a Hidden London tour of disused tunnels and a ventilation shaft, at Euston Station. I played on the swing outside King's Cross station three times. I did a beer glass walk from King's Cross station for the Flaneurs June Challenges. I walked through Ladywell Fields and went to see the Lewisham Dutch Elm, one of the great trees of London. I went to Ingress Meets in Lewisham, Waterloo, King's Cross, Sutton, the Isle of Dogs, Peckham and St Albans. I reached level 11 in Ingress. I went to abigailb's party one Saturday and ended up dancing at the Borderline until late. I went for a walk around New Malden. I visited Nottingham and drank a cocktail from a Frosties box, which contained crunchy nut cornflake infused rum, and I also drank a cocktail that contained toast syrup. Photos on Flickr: June 2016. A drink from a Frosties box? But how! Did they leave the little plastic bag inside?